The League Knights robotics team from BB&N made a great first impression in its inaugural competitive outing at the FIRST LEGO League Regional Qualifier held November 17 at Newton North High School. The all-rookie BB&N team made an impact in both the Research Project and the Robot Game facets of the competition and stood out by winning the "people's choice" FLL Idol Award for the Best Research Project Presentation, as voted by their fellow competitors and the parents and general public attending the event. The team representing BB&N consisted of seven third, fourth and fifth-graders. It was coached by John Galinato, Jason Wolkovitz and Andy Haycox of Build-It-Yourself. The FIRST LEGO League (FLL) is an annual international competition for elementary and middle school students organized by the Foundation for Inspiration and Recognition of Science and Technology (FIRST), founded in 1999 by Dean Kamen, inventor of the Segway personal transportation system. Over 160,000 children are expected to participate in the program this year. The competition stresses teamwork and is broken into two components - an investigative problem-solving research project and the construction and programming of an autonomous robot using the LEGO Mindstorm building system. Both components are based on a theme, which changes each year and is announced in September. The 2012 FLL theme is Senior Solutions. The research project requires teams to identify and learn about a problem faced by senior citizens, create an innovative solution to the problem and present the problem and solution to others. The robot game simulates tasks and activities that seniors engage in and problems that seniors must overcome. The teams choose from 14 tasks, or missions, then build and program LEGO robots that complete the chosen tasks on a pre-established "playing field" in two and a half minutes. 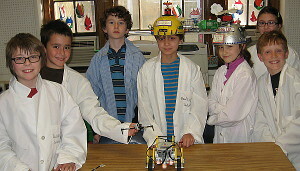 The Knights robotics team is a session offered by BB&N's After School Activities Program. In addition to meeting weekly after school on the BB&N campus, additional work was logged by students on weekends at the Build-It-Yourself Laboratory in Cambridge. For the research problem, the team determined that a significant percentage of senior citizens are sad, lonely or depressed. As a solution, the team decided to build a robot that will make senior citizens laugh. Using LEGO Mindstorm RCX controllers and building blocks they constructed robotic modules to display a joke, tell a fortune, deliver a cookie or candy, and entertain the senior with a dance. Using re-purposed materials they created playful puppet character robots to present the entertainment features and wrote a Robolab program to integrate all the mechanical modules. Finally, the team created a PowerPoint Lab Book to document the project and developed and rehearsed a presentation to explain it to seniors, judges and the general public. The result . . . Meet the ThingamaBobs, an entertaining display featuring puppets named Robert, Roberta and Robbie (the "Bobs") in a short animatronic show that instantly cheered up anyone and everyone who stopped by the BB&N League Knights "pit" and drew enough votes to win the Knights the FLL Idol trophy. The team's performance on the Robot Game portion of the competition had an equally impressive high point. Given the fact that the team members were all newcomers to LEGO robotics, the students, their parents and the coaches agreed early in the process to concentrate on just tackling a few of the available tasks in the robot challenge and focus on learning to build, gaining experience and having fun. This decision allowed them to concentrate on a smaller list of mechanical and software problems and simplify and use a modular approach to their solutions. As a result, the team was able to make a critical decision to use a tread-driven, instead of a wheel-driven, robot chassis, and the choice paid dividends in the difficult stair-climbing challenge, a task that proved to be an unsolvable obstacle for many of the more experienced teams. In the Knights' third attempt at the challenge, the team's robot not only climbed the stairs with ease, but also was able to then position itself perfectly on a teetering balance platform without falling. It was the equivalent of a gymnast executing a perfect vault and then precisely sticking the landing. As time ran out with the robot still perched on the platform, a rousing cheer went up from most of the spectators in the stands - Knights supporters and competitors supporters alike. "We couldn't have been more pleased and encouraged by the team's first experience," observed coach John Galinato, director of Build-It-Yourself. "The FIRST LEGO League program sets the stage for kids to exercise the integration of valuable, 21st century skills including technology skills (especially as they apply to social issues), collaboration and written and verbal presentation skills. Build-It-Yourself hopes it can help BB&N develop a community of 'builders' through future FLL events." A BB&N League Knights parent summed up the experience best: "All in all, a great effort on the creative and engineering fronts. We are looking forward to many more years of learning, participation, and competition! The robot team's sticking the landing on the "tippy-bridge" in round three was a great highlight and speaks to their persistence and ability to stay calm and focused under pressure, and the joke-and-candy-dispensing robot was a real crowd favorite -- truly creative and bringing a spirit of levity to the day!"